Sabrionna Barquet said she has been to a Bernie Sanders rally and cried when Donald Trump was elected president. But when she came to Grand Canyon University, her political beliefs changed — and not because she was influenced by people around her. “I’m the type who needs to think things through on my own,” she said. Now she calls herself “a closet conservative,” but she does so after a long pause and with considerable hesitation, realizing that her stance is atypical for a millennial. 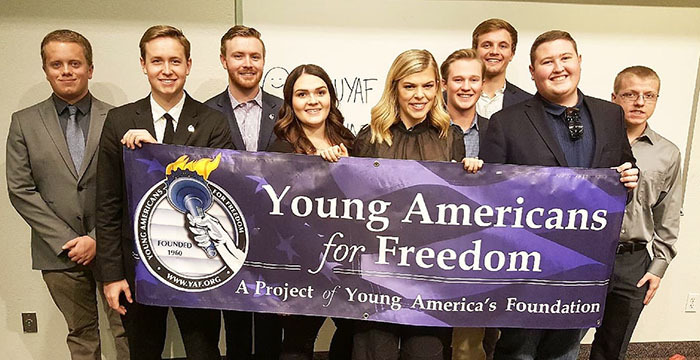 That’s what made Wednesday night important to her and the rest of the students who packed the Howerton Hall lecture room for an event organized by GCU’s Young Americans for Freedom chapter. 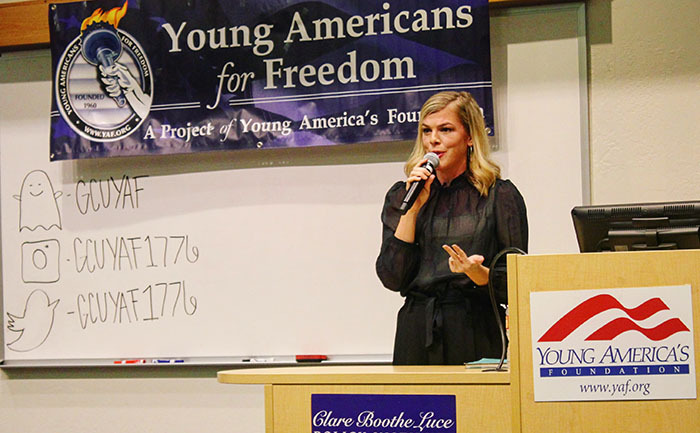 They were there, spilling out the doors in back, to hear Allie Stuckey, who writes “The Conservative Millennial” blog and is a regular on CRTV. She most certainly is not afraid to proclaim her conservative views. Stuckey’s message is that politics and spirituality are intertwined (“We don’t just have political divides, we have spiritual divides”), and while she skewers progressive beliefs as “anti-Biblical,” she also doesn’t spare Christians in her opinion of what must change. Part of that inaction, she added, might be a correction from beliefs and practices that were too harsh, but the result is a mainstream belief in what she called a “hipster Jesus” who “just wants you to feel good.” It has caused too many Christians, in her opinion, to take a step back. “We don’t want to go on ‘The View’ and be told we’re bad people,” she said. What’s the answer? Stuckey said it starts with reading the Bible and really learning what it’s all about, being bold in declaring its truth, and truly loving our neighbors. The Q&A and meet-and-greet sessions that followed were anything but quiet as Stuckey first answered 14 questions and then spent time with an even longer line of wellwishers. “The number one thing that I heard from people was, ‘Thank you for including your faith in politics because we don’t hear that very much,’” she said. “I think that’s true, and I’m not patting myself on the back for that at all. Those are two things that I’m passionate about, and I’ve never been able to separate them. To me, they just go together so much. Another student in attendance, Dillon Parrish, said he comes from a similar background – most of his friends growing up in Georgia were progressives, and he values what Stuckey has to offer. “She confirmed a lot of things I really believe,” he added. 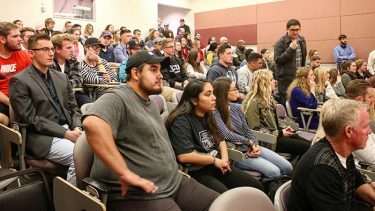 The GCU Young Americans for Freedom chapter has 30 members, and its president and founder, Connor Brinton, said Wednesday’s crowd was typical of the turnout it gets. Stuckey’s views fall in line perfectly with those of the chapter. “We really think this helps people understand our positions,” he said. The ascent of Stuckey, a 2014 Furman University graduate, is a recent phenomenon. 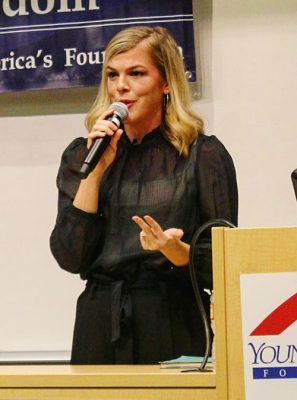 Her blog entered the political mainstream during the 2016 presidential election cycle, and now she crisscrosses the country on regular speaking engagements (8-10 this fall alone, she estimated). The night before her GCU appearance, for example, she was at Virginia Tech University. She said she enjoys speaking to groups of all political persuasions, but visiting a Christian university was definitely a highlight for her.